Acknowledgements. Glossary. Foreword Margaret Archer. Introduction Len Barton and Sally Tomlinson. Part 1: Ideologies, Issues and Practices. 1. The Mentally Retarded: Ideologies of Care and Surplus Population Mårten Söder. 2. 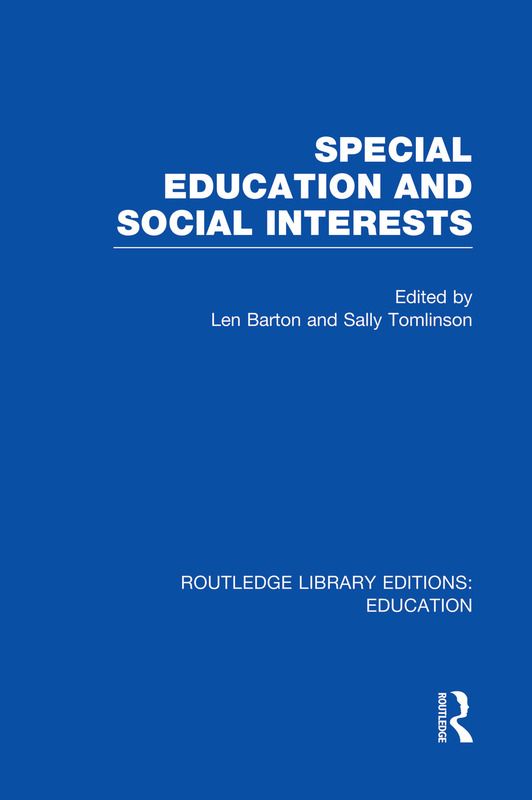 Comparative Special Education: Ideology, Differentiation and Allocation in England and the United States James G Carrier. 3. The Politics of Integration in England Len Barton and Sally Tomlinson. 4. The Differential Diagnosis of Special Education: Managing Social Pathology as Individual Disability Deborah S Bart. 5. The Role of the Educational Psychologist in the Post-Warnock Era John Quicke. Part 2: The Nature and Uses of Qualitative Approaches. 6. The Labelling of Educable Mentally-retarded Children Louis Rowitz and Joan E Gunn. 7. Case Studies of Mainstreaming: A Symbolic Interactionist Approach to Special Schooling Robert Bogdan and Judy Kugelmass. 8. Adolescence and Physical Imparement: An Interactionist View Alan Hurst. 9. Socially Produced Identities, Intimacy and the Problem of Competence among the Retarded David A Goode. Notes on Contributors. Indices.